Have you ever met OnlineFabricStore? They're just a super-duper place on the internets where you can buy great fabric at great prices. They are also one of the sponsors for Haven Conference each year. And each year they generously give each attendee one or two nice-sized pieces of fabric. In 2013 we received a piece of high grade burlap - that I use for my table runner - and another piece that I still haven't used. This year I received 1 1/2 yards of a large floral outdoor fabric. It was really pretty, but . . .
it was completely out of my color palate. I hadn't a clue what I would do with it. So when I came home and unpacked my swag bag I set it aside on the dining room table, thinking that I would keep it out where I could see it and maybe I would eventually think of something to do with it. 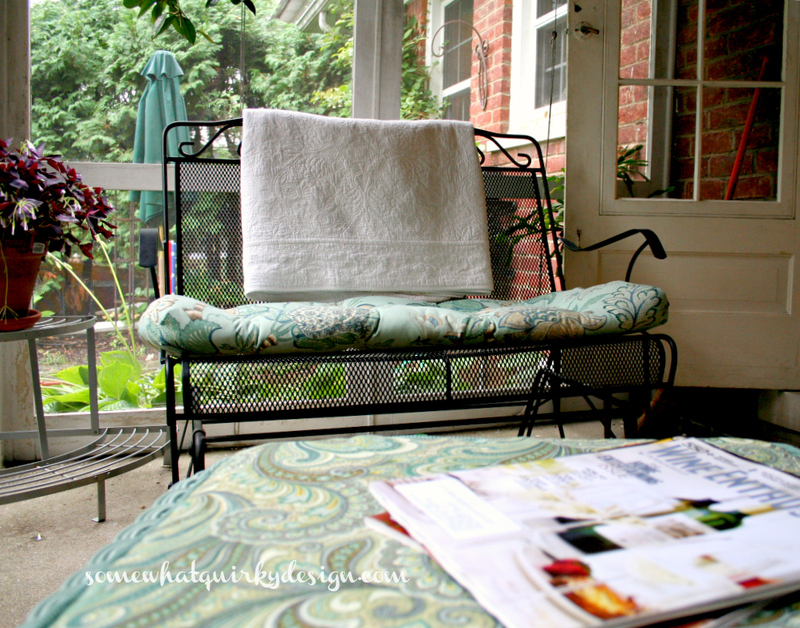 As it turns out, on that same dining room table I had the stack of fabric I was using to cover the cushions for my friend Jennifer's porch furniture. It matched the palate perfectly. that the cushion she already had didn't quite match. She graciously agreed to let me do it for free! Turns out the cushion was also 5 inches too wide for the glider she was using it on. "Why would I be glad?" You say. "Well because now I can show you how to take a tufted outdoor cushion and make it smaller and recover it!" I say. "Why that is really awesome! 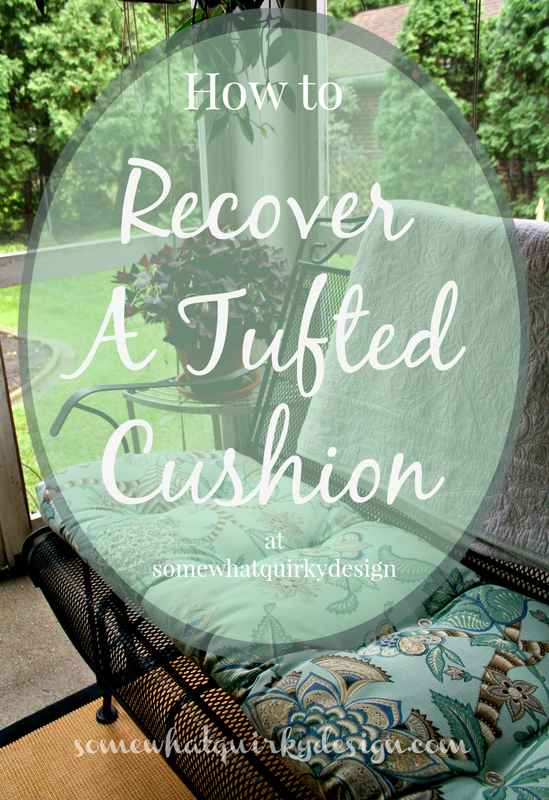 I was just thinking that I would like to know how to make my outdoor tufted cushion 4 inches smaller and recover it!" You say. "Well let me show you how!" I say. 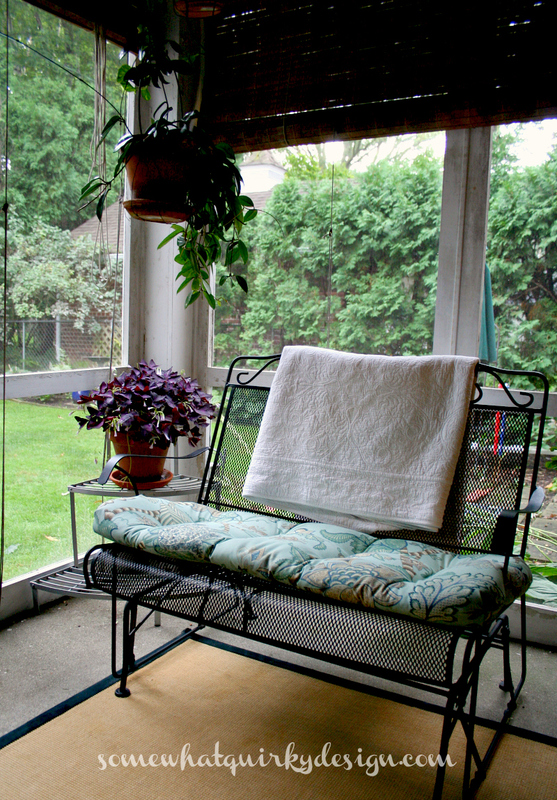 Enough fabric to cover your old cushion - I used 1 1/2 yards of 54 inch wide fabric. Do this around the edges in a curve that gradually tapers to meet with the front seams. Be sure not to wake the cat that plants himself right in the center of your sewing every time you sew. Cut excess fabric about 1/2 inch from the pin line. Remove the pins and slip one layer of fabric under the other, pinning as you go. 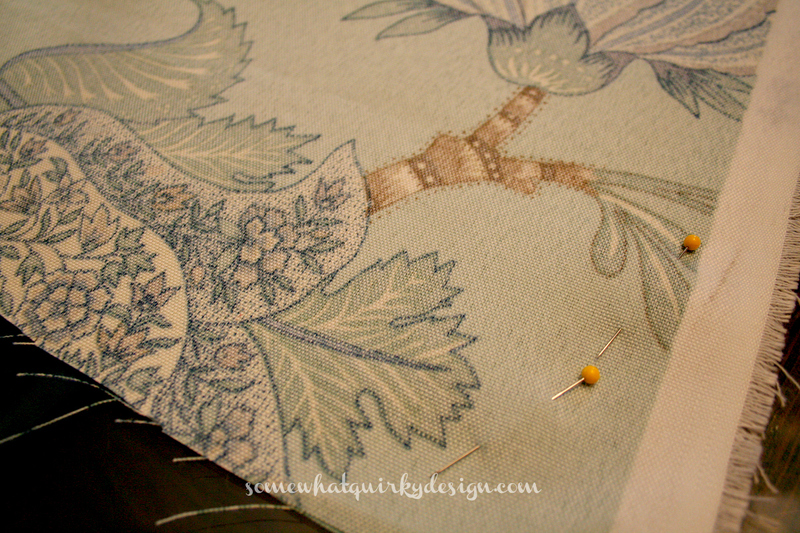 Use your big ole needle and roughly (or neatly if you're that kind of girl) baste the fabric to fit. Repeat on the other end of cushion. 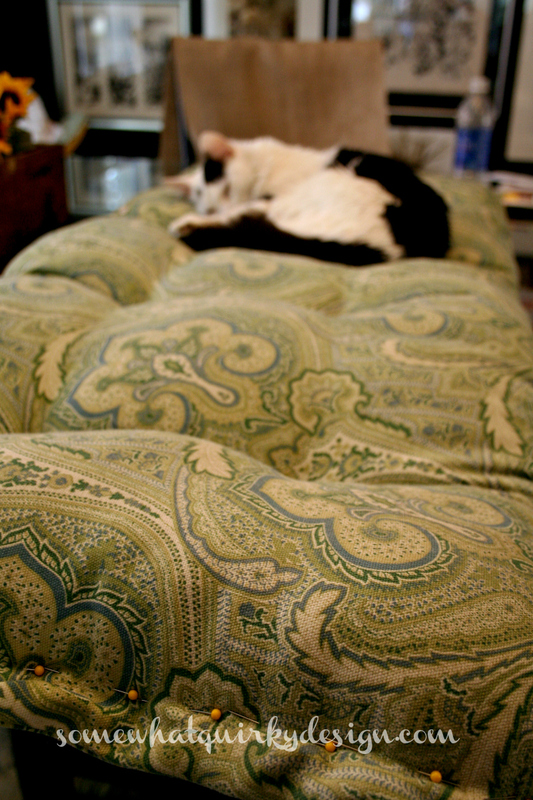 The new size (width) of the cushion will depend on how tightly you squished it in when you pinned it. I was able to remove about 4 inches total. Now it was ready to cover. 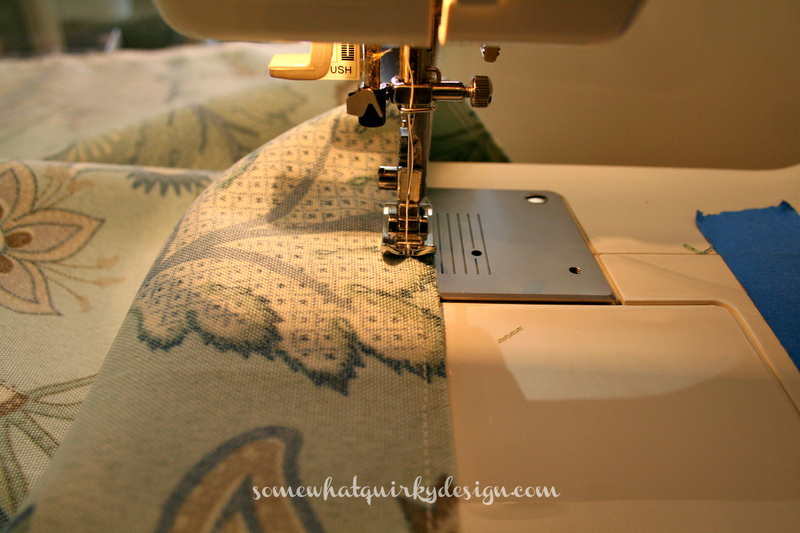 Use your cushion to determine roughly how much fabric you will need. 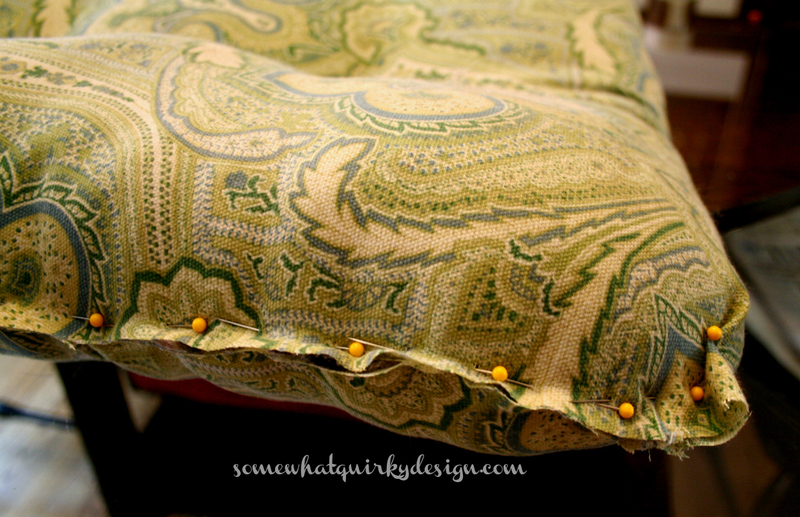 Wrap fabric around cushion lengthwise and pin tightly around cushion. 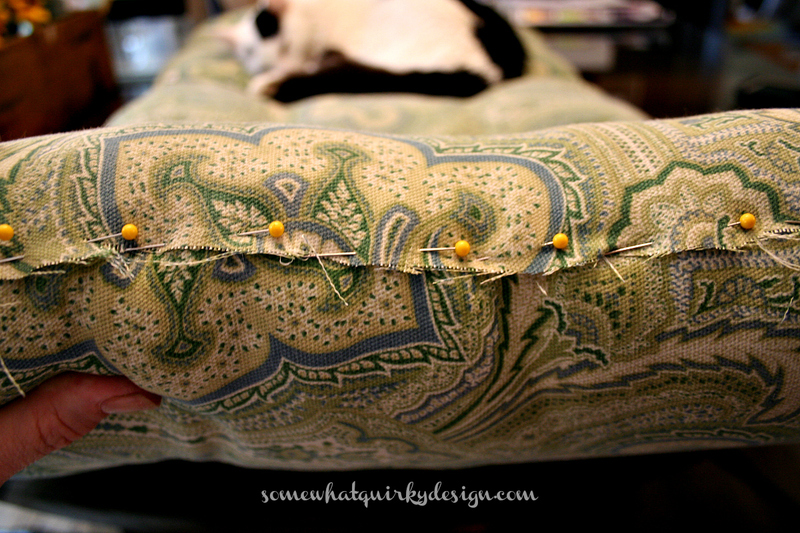 Slip cushion from the fabric (don't unpin) and measure from pin line to previously sewn edge of fabric. Measurements will not likely be the same all the way across,so you will need to arrive at a measurement you are happy with (probably close to your smallest measurement) and mark a sewing line with a pencil or fabric marker. Sew the fabric - right sides together - along the marked line. NOTE: It is likely that your fabric will be a perfect or tight fit and you just have to sew the edges in whatever seam allowance makes it fit. Trim seam to 1/2" if needed. 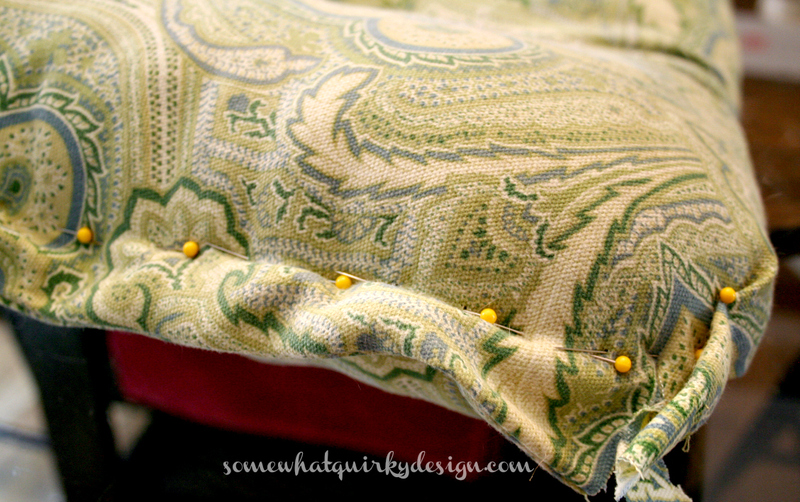 Wrap fabric around cushion - wrong side out - with the seam line centered across the length of the cushion. 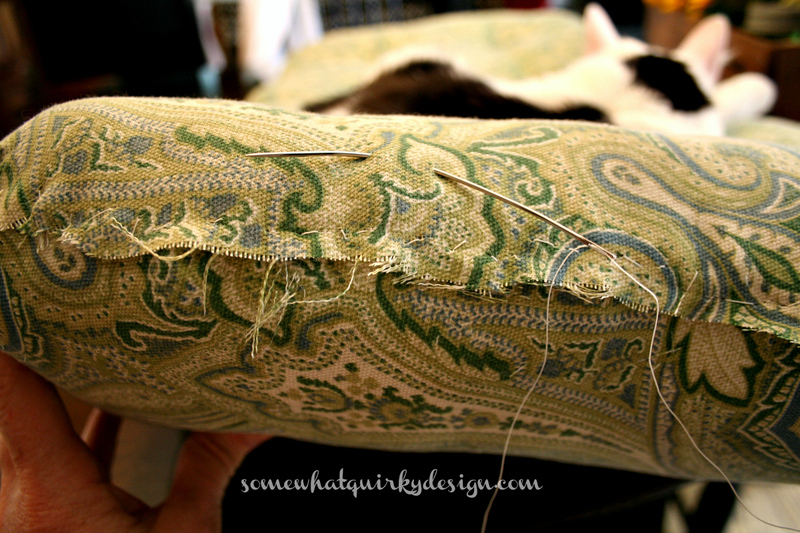 Pin unsewn edges together tightly along the length of the cushion. Trim excess fabric to 1/2"
Now you basically have a tube of fabric. Sew one of the ends together with a 1/2" seam. This will be like an inside out pillow case. 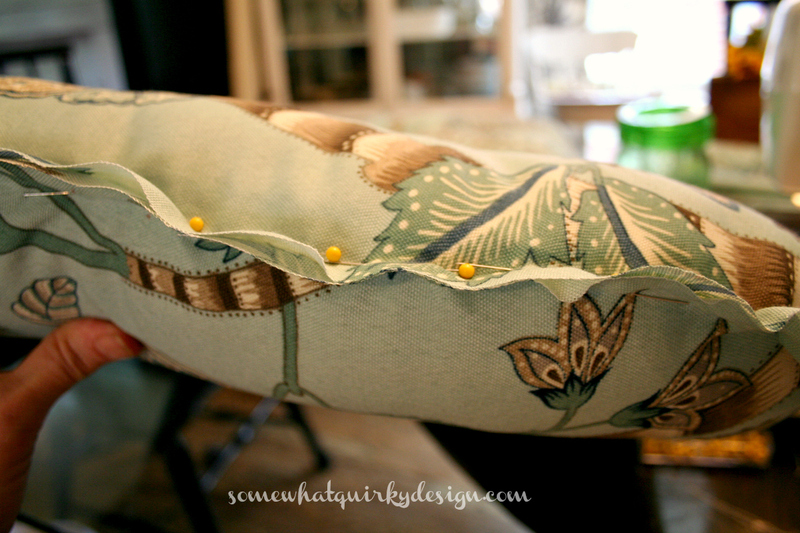 Slip the case over the cushion with seams centered along the back (if only one seam) and front of the cushion. Pull the cushion all the way to the end. Pin the around the curved corners to make the case fit tightly. Trim excess fabric from curved edges. Turn your case right side out and insert the cushion. Leave the open end open. 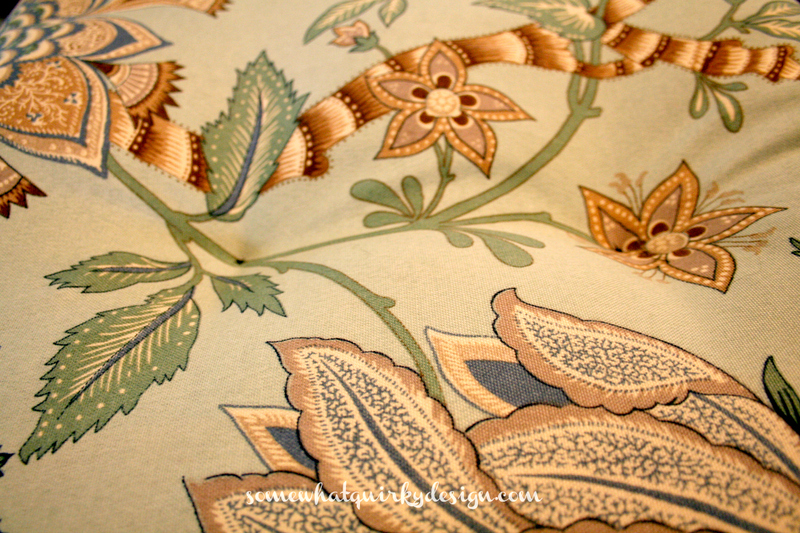 Starting with the tufts closest to the sewn end, feel through the fabric to find the center of the tufted area. Use the heaviest thread you have - and the heaviest needle you have - sew through the center and pull fabric together tightly. This will not be particularly easy. This is why I tuft first and do the buttons later. Keep going down the pillow working toward the unsewn end. This step is not difficult like rocket science or anything, but it is my least favorite part! This is where you add the buttons. You need a button for the top and bottom so that it can be used both ways. It also covers up the stitching and makes the connection stronger. Unless you order buttons online it will be difficult to find 16 (or whatever number) buttons that match. I was able to find enough of two different kinds of buttons to do this step. Sew buttons at each tuft. Use your strongest thread. If your long needle will fit through the button holes use your long needle. It will be easier. If it doesn't - then well dang! 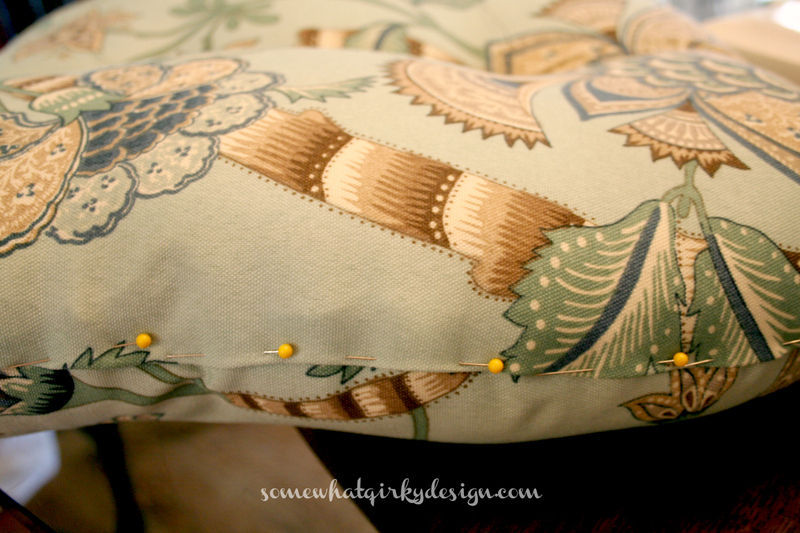 Pin fabric tightly around open end of cushion and trim to 1/2 inch. Unpin and slip bottom fabric under the top fabric. Fold top fabric under 1/2 inch and pin. Slip stitch, take out your pins and put it on your glider! Please don't think this is hard just because there are several steps. It is easy. 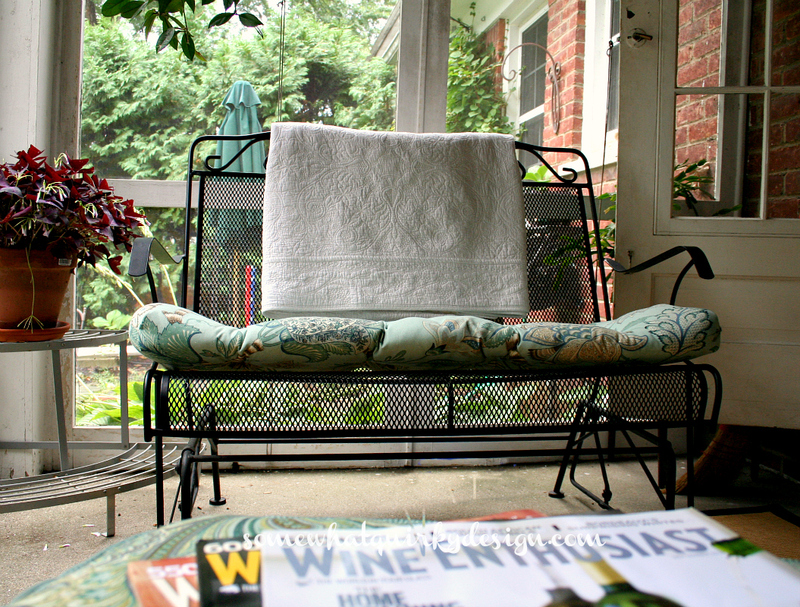 So buy some outdoor fabric from OnlineFabricStore, or somewhere, and cover up your old, worn out outdoor cushions! I'm pretty sure it is really hard. It looks really hard! The end result is so pretty, though. Turned out really pretty! Tufting adds a bit of elegance to cushions. Now you need to make one for the back. The seat is too shallow to have one on the back - more's the pity. I wish I was not so petrified of any sewing project. I do have a cat that sleeps on all active projects though. Great instructions! And the cushion turned out beautifully! Your friend is lucky to have you for a friend!! 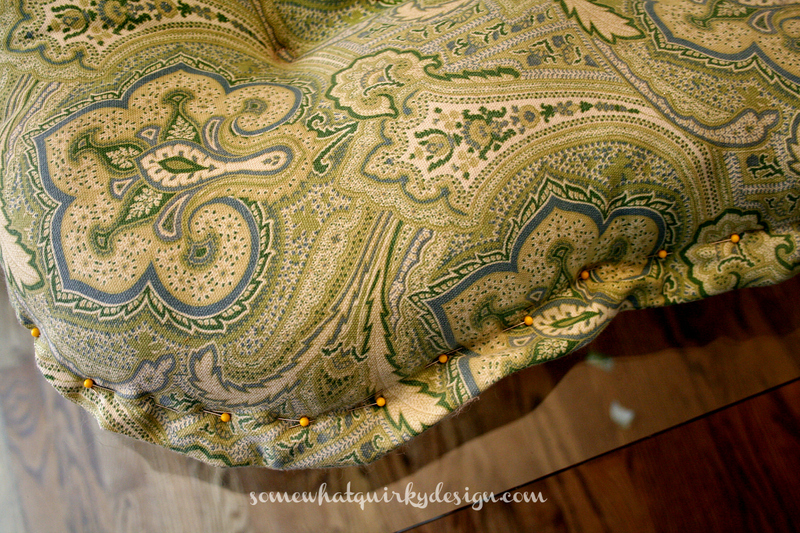 I have used On-Line Fabrics before and was happy with them. My son and his girlfriend bought me some fabric in Turkey recently and it isn't really my color palette. I am thinking that I will make a cushion for a bench that my daughter no longer wants. I like the fabric and the colors of the cushion you made. OK, I pinned this. Because it's gorgeous. Because I have a new sewing machine that is I have big dreams about using. Even though I felt like this was way to much for a beginner project, I look forward to the day when i'm confident enough go give this a try!